Please visit Westinghouse College Prep online. Download or view the school’s brochure. Speak with Westinghouse College Prep Counseling Chair and Director of Admissions, Rebecca Miller at 773-534-6411. 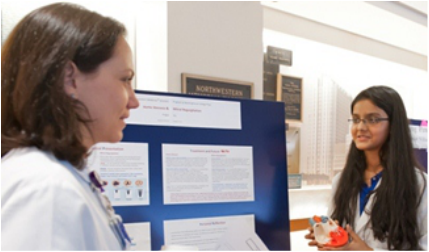 Northwestern Medicine Scholars Class of 2015’s Pragya (right) discusses matters of the heart during a cardiology presentation. To support this important outreach program, consider making a gift through the Northwestern Memorial Foundation.